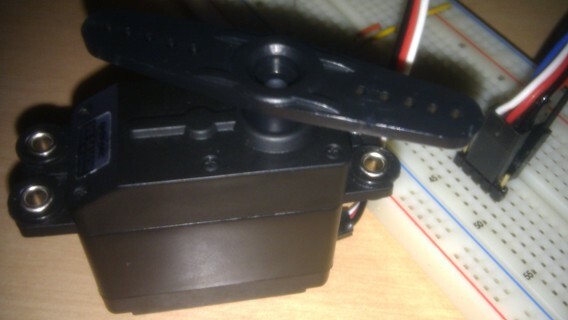 "Servo motors have three wires: power, ground, and signal. The power wire is typically red, and should be connected to the 5V pin on the Arduino board. The ground wire is typically black or brown and should be connected to a ground pin on the Arduino board. The signal pin is typically yellow, orange or white and should be connected to a digital pin on the Arduino board. Note servos draw considerable power, so if you need to drive more than one or two, you'll probably need to power them from a separate supply (i.e. not the +5V pin on your Arduino). Be sure to connect the grounds of the Arduino and external power supply together." I bought my Servo motors from InMotion who imported them from SparkFun. It's easy to control a Servo with Arduino using the libraries distributed with the Arduino IDE, but with only three wires, how is that controlled? A servo motor expects a PWM signal with a very specific period and duty time. Usually a 20ms period and a 1ms to 2ms as duty time. On a regular servo the minimal duty cycle means a 0º position, the maximum corresponds to 180º and half way equals 90º. On a full rotation servo, each period to motor rotates acording to the duty cycle. Under 1,5ms rotates counter-clockwise and above 1,5ms rotates clockwise. But for the best control, why not use a tested and proven library? So I used Arduino's IDE Sweep example that rotates the Servo from side to side (0 to 180 degrees and back) using a class designed for that purpose. The Sweep example seems simple and self-explanatory for me to give more detail about it. In my full rotation servo I noticed that it rotated more going counter-clockwise than when moving clockwise.